$$$ $500.00 CASH REWARD FOR BAILEYS SAFE RETURN HOME $$$ My dog went missing about around 6:30pm on 12/31/18. 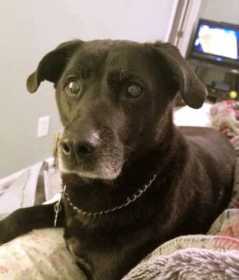 She is a black lab mix that is 12 old years. 45-50 lbs. She is all black except for her muzzle is turning white, the bottoms of her feet are white and has a white spot on her chest. She also has a superficial tumor under her front leg and a small "doggie skin tag" under her left eye. She also was weaing a silver choke collar.